14K Solid Yellow Gold Men's Elliptical Link Bracelet. Links are satin-finished on the outside (also available in all polished/shiny by request). Bracelet measures 6.75mm wide, 2.3mm thick. Bracelet weight (approx): 8" - 18.9 grams, 8 1/2" - 20.1 grams, 9" - 21.3 grams (available in all lengths by request). Also available in white gold or rose gold (shown below). 18K gold also available by request. 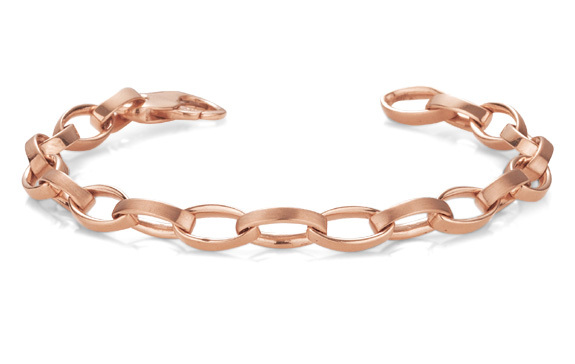 We guarantee our Men's Elliptical Link Bracelet, 14K Gold to be high quality, authentic jewelry, as described above.